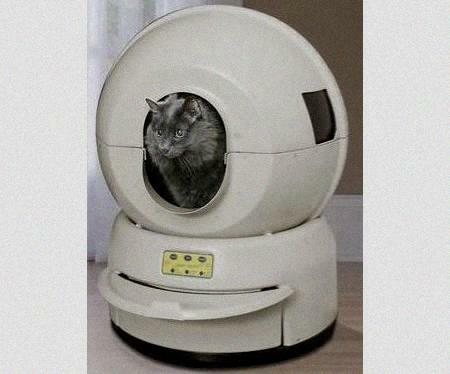 Litter Robot (LR) is a self-cleaning litter box that frees cat owners from the chore of scooping. The Litter Robot consists of a plastic globe on top of a base. After a cat exits the globe, the inside of the globe rotates and collects waste litter. The waste litter falls into the drawer in the base below, and the globe rotates back to its original position. All the owner needs to do is empty the drawer! Types: Litter Robot offers several versions. The standard model consists of a globe and a dome, and is available in black, beige and grey. The Bubble unit has a clear plastic window attached to the back and extends the globe depth by three inches, which makes it ideal for larger cats. There are also “Reconditioned” versions of both models, which are used and refurbished models that are sold at a lower price. An additional unit, the Kitty A Gogo, is also available. This unit consists of a plastic dome over a large, pull-out tray. Though this model does not rotate and requires scooping by hand, it is a cleaner and more stylish alternative to traditional and is available in fun patterns such as leopard print, polka dots, and red flowers. 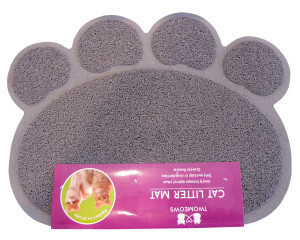 Two Meows Gray Litter Mat reduces the litter mess around your box and home. 15 inches, and comes with a flip door, a scoop, and a disposable liner. Besides the basics, there are additional accessories for the standard, bubble and Kitty A Gogo boxes. Owners who want to disguise their cat’s box can purchase wooden cabinets for the standard and bubble units. They may also purchase an LR2 Ramp, which allows for easier access for older cats. Box parts and extra supplies are available as well. Also consider adding a litter mat outside your robot. • Adjustable settings, which allow for automatic and manual waste disposal. • The rotating mechanism and sensors inside are designed to sense the presence of medium and larger cats. However, the sensor may not detect kittens and cats weighing less than five pounds. Fortunately, this problem can be avoided by turning off the sensor or unplugging the device until the globe needs to be emptied and the waste drawer scooped. • Some types of cat litter, such as Feline Pine, cannot be used with the Litter Robot. • Expensive. The Kitty A Gogo starts at $100, and the Litter Robotss begin at $309 for the reconditioned models, with the new models going for $369. The Bubble versions cost an extra 20 dollars. However, used models can sometimes be found on Amazon for a lower price. 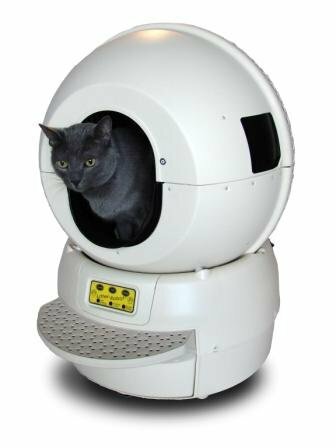 Despite the hefty price, the robots have been well-received by many cat owners, and the LRs have gotten good reviews on sites like Amazon.com. Users on the Litter Robot website have written that “Our cat loves it and so do his parents! We bought a refurbished model about a month ago, and he used it right away… No smell, no mess and that is amazing.” A reviewer on Amazon wrote that “This machine has changed our lives!” Customers noted a few problems with the LR, citing loudness, cost, size and scattered litter, as well as the occasional mechanical flaw. Some reviewers also noted that their cats would have an “accident” because the size and shape of the globe would force the cats to inadvertently pee on the lip of the entrance or on the step. However, despite some of the design issues, the LR boxes have received overwhelmingly positive reviews, and many customers are greatly appreciative of the LR’s convenience and overall ease of use. The Litter Robot boxes are an ideal choice for cat owners who are willing to spend a little extra money for a convenient and cleaner alternative to traditional.